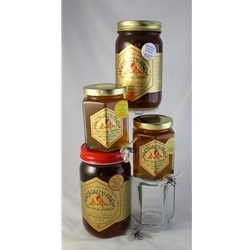 Allergy Relief for Berkeley (East Bay) is provided with these Honeys: One 24 oz. Pint Regional Berkeley Honey, One 24 oz. Pint Bay Area Blend, One 8 oz. Eucalyptus/Acacia, One 8 oz. Honey-So-Fresh. These 4 Very Local Honeys will help you find relief from the symptoms of pollen allergies in the greater San Francisco Bay Area & Mid-California all year round. Choose from the three seasonal packages offered below. Four Seasons Package ~ East BayAllergy Relief packages include: One 24 oz. Pint Regional East Bay Honey, One 24 oz. Pint Bay Area Blend, One 8 oz. Eucalyptus/Acacia, One 8 oz. Honey-So-Fresh. This selection features 4 Local Honeys to help you find relief from the symptoms of pollen allergies in the greater San Francisco Bay Area & Mid-California year-round. Spring~Summer~Fall East Bay Allergy Relief Package: Spring thru Fall packages include: One 24 oz. Pint Regional East Bay Honey, One 24 oz. Pint Bay Area Blend & One 8 oz. Honey-So-Fresh. This selection features 3 Local Honeys to help you find relief from the symptoms of pollen allergies in the greater San Francisco Bay Area & Mid-California. The honeys shipped to you in this package will be seasonally correct as well as location-specific. Winter Package ~ East Bay Allergy Relief packages include: One 24 oz. Pint Regional East bay Honey, One 24 oz. Pint Bay Area Blend & One 8 oz. Eucalyptus/Acacia. This selection features 3 Local Honeys to help you find relief from the symptoms of pollen allergies in the greater San Francisco Bay Area & Mid-California from mid-November thru early Spring.